Send me your scorecards! 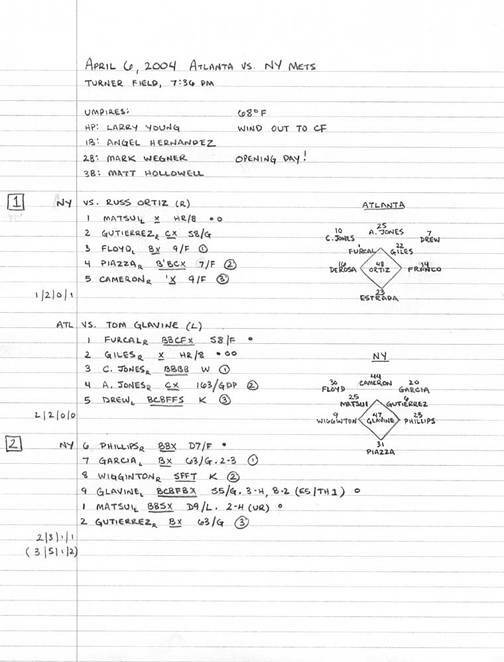 Paper or digital, yours or someone else's, if it preserves baseball data in a unique way I'm interested. Below is the current collection. Minnesota Twins fan Mark Davey writes: "when we go to the games on Wednesday nights, they hand out 'Twingo' cards. 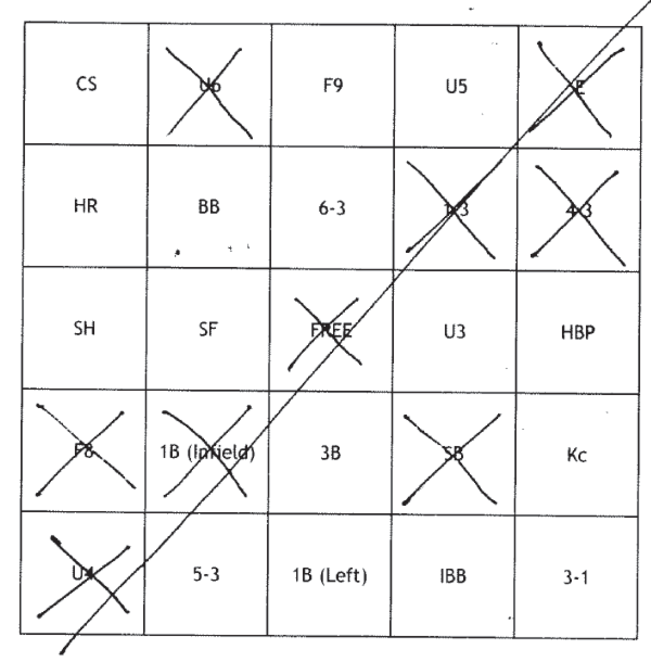 Twingo cards are bingo cards with all of the spaces filled in with baseball plays." When I heard about Twingo I fell immediately in love. 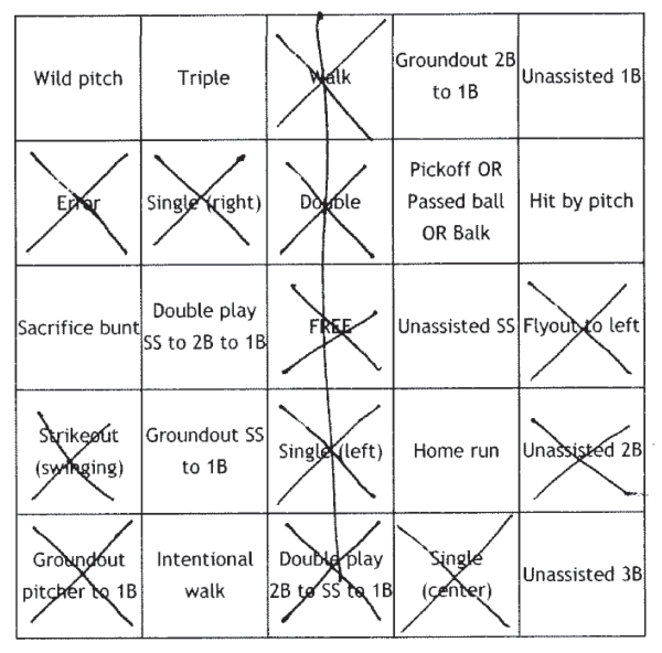 Baseball bingo is a free-form method of scorekeeping that overlays a game on top of the baseball game (a "meta-game?"). And for those of us that can't get to Minneapolis on Wednesdays, Davey has created a full-featured baseball bingo card generator. You can even generate cards with Project Scoresheet notation! Below are some winning cards printed from Davey's web site. Why the change? Garagiola considered a strikeout the ultimate "stop" by the pitcher and a hit the opposite: a "go" by the batter. Riggs' rationale is that a walk is closer to the opposite of a strikeout and more of a blemish on the pitcher's record. 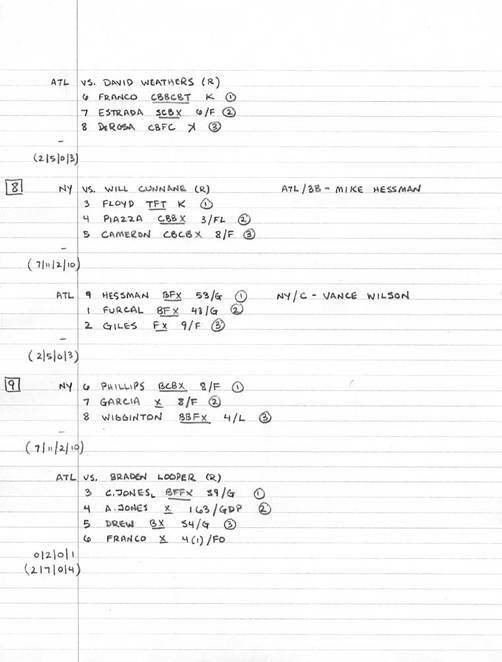 The addition of orange came after Dickson's book was written, as did the adoption (to my delight) of the Reisner Scorecard. In the lineup and opposing pitchers areas, starting players' names, numbers, and in/out data are written in the team's dominant color (red for the Cardinals in the example here) and substitutes are in black. Notice how quickly you can spot the strikeouts repeatedly breaking up chances for a big inning, as well as the scattered hits (and lack of walks). 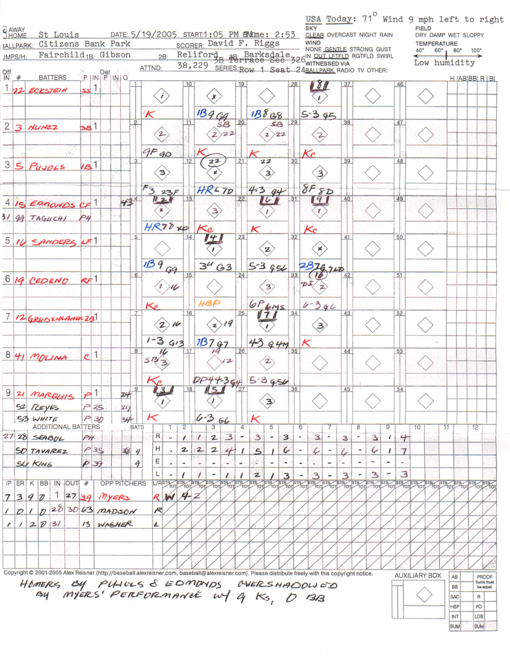 A home run, like all hits, is blue and a strikeout is red on this scorecard. Typed after returning home from the game, seat location is added to the usual game condition data. If we keep score at baseball games played on a field, why not at those played on a table top? 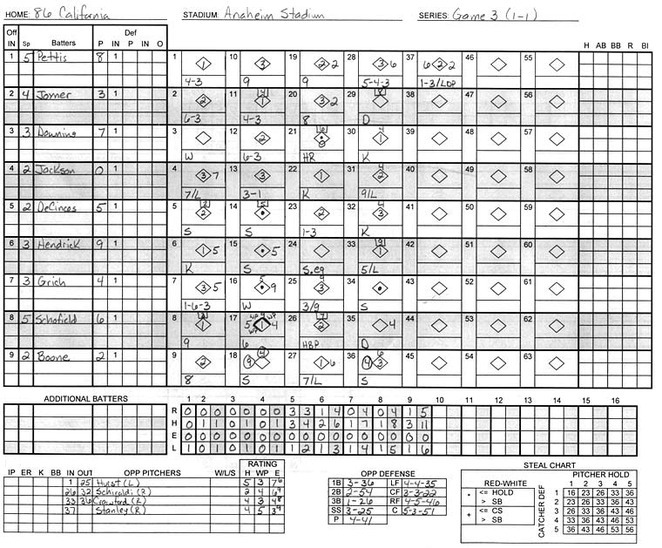 Using a Reisner scorecard he modified to suit Replay Baseball, Ken Brown does just that. Space to record ratings of opposing batters and pitchers has been added as well as a steal chart for quick reference. 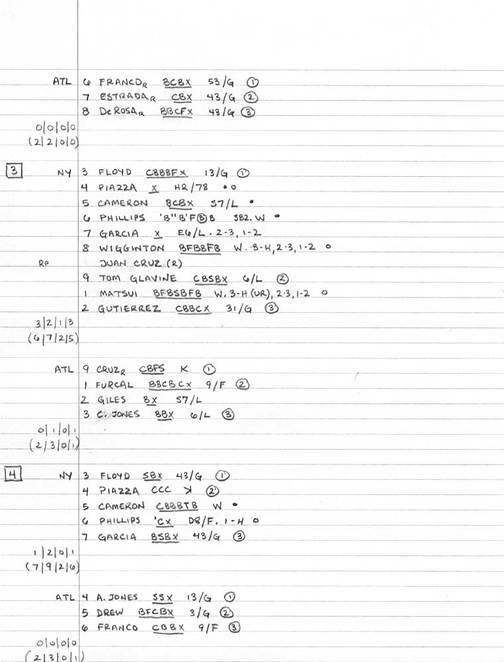 He also tacked on an additional column of at-bat boxes and several columns of inning totals to accommodate those marathon games. Replay Baseball has a blurb on their web site about Ken's work. You can also download a blank scorecard for your own use. 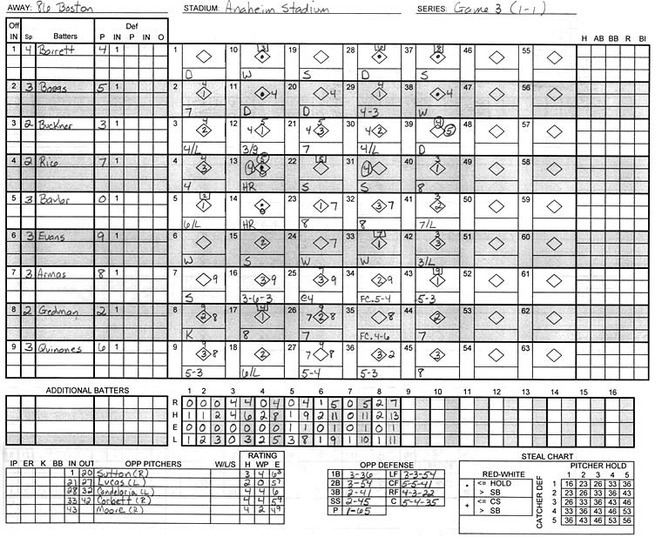 Player ratings can be recorded on this scorecard specialized for Replay Baseball. You arrive at the ballpark with clever banner and oversized foam finger, but wait...you forgot to bring a scorecard! You can't buy one of those awful things from the vendor inside. It's time to improvise. Clearly this method is not polished, but I think the benefits are worth examining for those interested in scorecard design. I, for one, was surprised by how quickly and readably one could notate offensive and defensive substitutions. If anyone tries this method or has any ideas for improving it I'd love to hear about it. Pitches (underlined only for data separation) use the current Retrosheet notation ("S" = swinging strike, "F" = foul, "T" = tipped, etc) with throws to bases ("1", "2", or "3") in superscript. 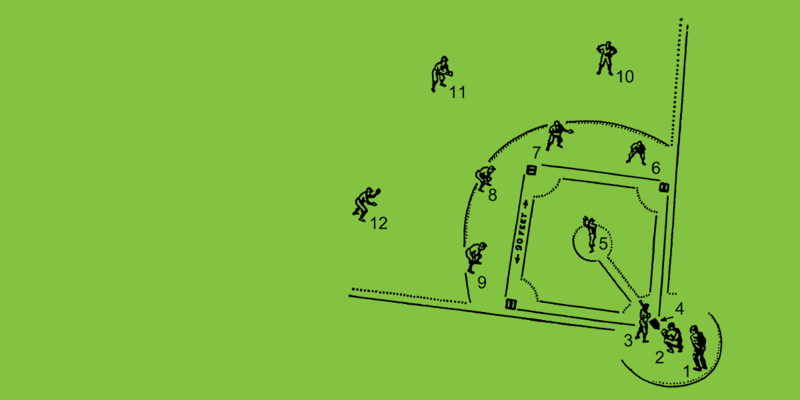 A dot at the end of a batter's line means he scored, and open circles are for RBIs. 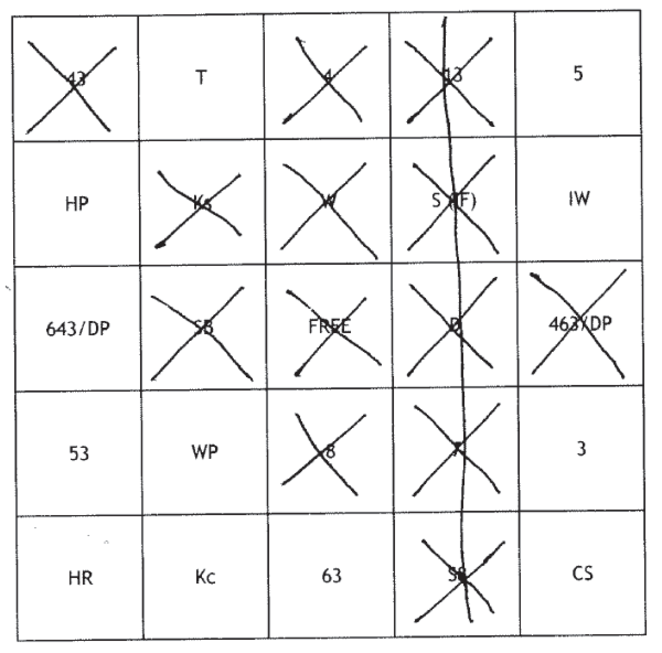 Circled numbers are outs. 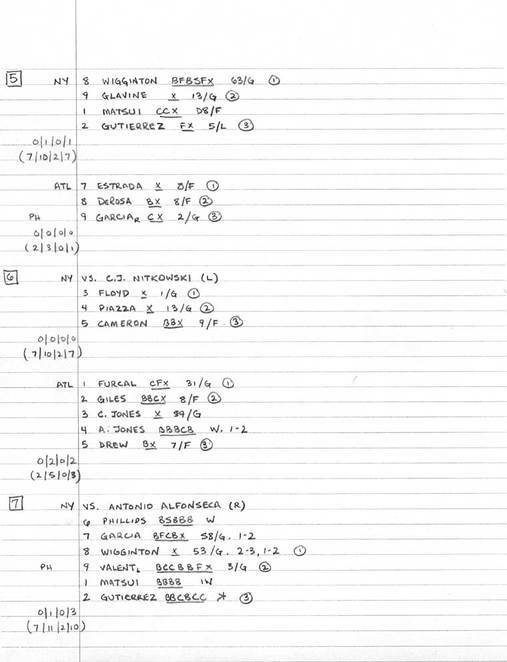 Inning totals are indicated in the left margin ( R | H | E | LOB ) with game-so-far totals in parentheses. Obviously one could add pitch totals to these, but as I couldn't think of an especially readable way of doing so, I've omitted them. A relief pitcher is notated within the strict chronological account of the game. Piazza, batting 4th in the lineup, right-handed this appearance, sees the pitch sequence: ball, throw to 1B, ball, called strike, put in play. He winds up flying out to the left fielder for the 2nd out of the inning.